Taking delivery of a new Corvette is a wonderful experience. Taking delivery of a new Corvette at the National Corvette Museum is something that should be on every Corvette lovers bucket list. It will be the first road trip you take in your Corvette. The R8C option lets you go to the NCM and pick up your car. 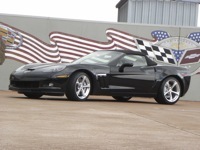 Your Corvette will have been built about 2 weeks before you can get your car. The museum staff does the pre-delivery preparation of your Vette. The cost of the R8C is now $995. You will also have to pay the transportation charge as all Corvettes sold have the same charge regardless of the distance from the plant to the dealer. My experience is that the R8C is the best dealer prep you can get. The crew at the Museum does more Corvette preparations than any dealer and because the plant is across the street, any issue they may find can be corrected by the folks that built the car. I have heard that in some rare occasions, they have taken the car back to the plant. 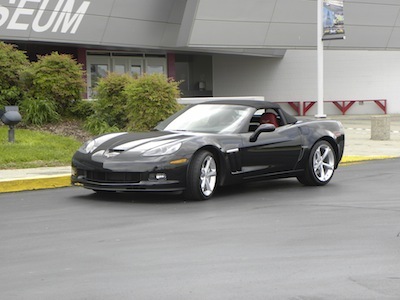 When you get your Corvette at the NCM, it will usually have about 3 miles on the odometer. Most of these are put on at the end of the assembly line when the car is checked out on a dynamometer. If it has about 25 miles on the odometer, that is an indication that the car was randomly picked to be evaluated by a Corvette engineer. This is GOOD! You get someone that knows every aspect of the Corvette to test drive your car and make sure that it meets or exceeds every measurement. Depending on where you live, you may fly into Nashville, TN. The NCM has a special arrangement with Enterprise Car Rental that gets you a car that can be left at the NCM and there is not penalty for not returning it to the airport rental facility. I have always stayed at the University Plaza when visiting Bowling Green. It is about an hour from the Nashville airport. If you get the morning time slot for delivery, you will be finished in the early afternoon. You arrive at the NCM at the designated time and you will be greeted like a King and Queen. You meet your delivery guide and he will make you completely at ease. They first go through the paperwork making sure everything is in order. This includes giving them your license plates. Next you get to tour the plant. 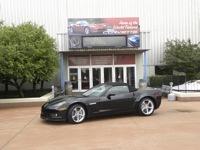 I have been on many, many Corvette plant tours. Nothing compares to a tour when you are picking up a car. First, your guide is vastly more knowledgeable than the guides that conduct the public tours. Second, you get to see areas that are not on the public tour. And lastly, it seems as if every person in the plant takes a moment to thank you for purchasing your Corvette. One more thing, you will start a Corvette for its birth at the end of the line. 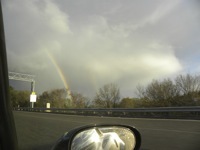 Your can't have a rainbow without rain. The first rain for our Grand Sport on the last leg of the trip home.